What can we report this glorious Thursday morning? Well we can report that we’re not in Thursday morning or Kansas or anywhere else or anymore, we can report we’re having a day infested endless so called punk pop bands wit their slightly straining throaty vocals and their regulation insert melodic thoughtful bit here, all sounding pretty much the same, any of them could be from anywhere and made by anyone, that and an inbox cluttered up with the same old same old post rock bands who don’t seem to possess the courage to go somewhere even slightly different and no, I don’t want to upgrade, stop calling me when I’m busy listening to generic not very so called punk bands who are about as punk rock as cottage cheese with bits of pineapple in. Wednesday morning was cluttered up with waste of time bands. What are Blind Eye Factory doing? Who are they anyway? Kind of forgotten how good VILE IMBECILES were, are the Brighton band still out there? Urban spaces and ephemera provide an important creative impetus to Carlin´s work. The light of an autumn afternoon reflected in a broken window pane, or the swirling coils of a barbed wire fence, or the traces of an overflow pipe like pigment on a wall, all are snapshot by her mind and filtered through her alchemical imagination and the poetics of her ceaseless gesture making to convey their essence. She wonders at the serendipity of man-marks. She then takes these very personal mementoes and recollects them in a Wordsworthian tranquility. The emotional response to oftentimes random juxtapositions in these found compositions is paramount to the process of her art production, indeed it drives the very movement and intensity of her brush. In her work she seeks to understand how things around her exist and why they exist in the way that they do. These thoughts very often drive her imagination to search for the perfect visual language to convey it. In examining the relationship between the metaphysical world and the phenomenal, her work is fundamentally the affirmation of the transcendental possibilities of the transient. It rejoices in the beauty of impermanence. It does not mourn that we can never step in the same Heraclitean stream twice but rather revels in it. Every brush stroke, every mark on canvas is a moment to rejoice in because it will never be made in the same way again. She challenges herself every day to search for new combinations of meanings and create new relationships. This fills her with hope because her art is the art of possibility. 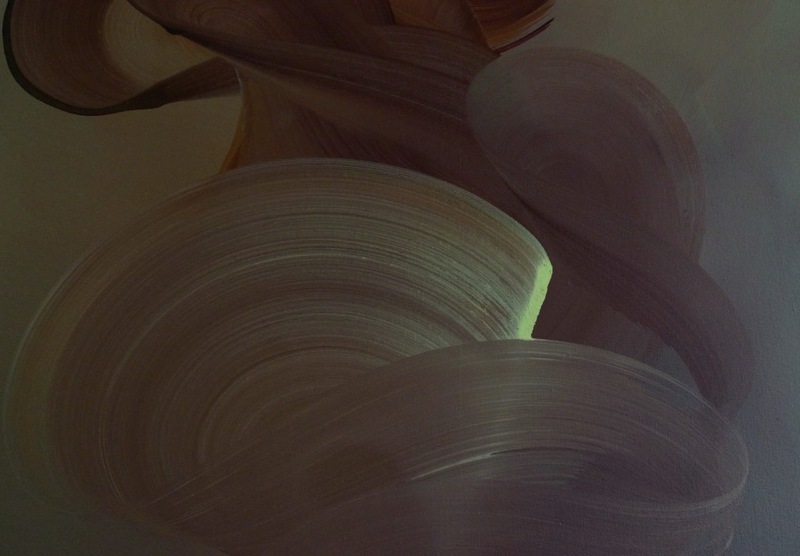 Abstraction, whether Carlin conveys it through photography or in painting, is the only language she feels is appropriate to convey what she sees and what she feels when she sees. She divines the abstract in everything around her: colour, form, poetry, where others would see only noise. She discovers beauty and then through her process unveils it, bears witness to it. Her work is the apotheosis of the mundane. This show attempts to showcase not just the powerful results of this process, in terms of her awe-inspiring canvases, but also the very beauty of the process itself. ← ORGAN THING: AK/DK hit the Old Blue Last tonight….